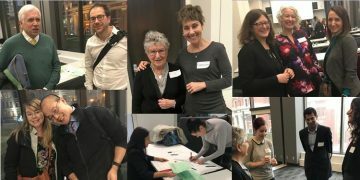 The 9th Annual Dr. Fred Bryans Faculty Forum took place on Thursday, January 31, 2019 at the SFU Harbour Centre in downtown Vancouver. We started the Forum with a workshop on grant proposal development co-led by Amber Hui (WHRI/BCCHR) and Dawn McArthur (BCCHR). Amber and Dawn led 30 department members through the grant development process. They encouraged attendees to focus on good science first and foremost and to take time to develop ideas and collaborations. William Fraser (University of Sherbrooke) launched the afternoon forum, attended by 50 people, by sharing his research career story. He talked about the importance of Clinician Scientists and the key roles that mentorship, protected time and salary support played in facilitating his research career. He also shared with the audience examples of successful transdisciplinary research collaboratives in the Canadian context, including the Sino-Canada HeLTI: A Multifaceted Community-Family-Mother-Child Intervention Study for the Prevention of Childhood Obesity. Excellent presentations from our own department members followed. 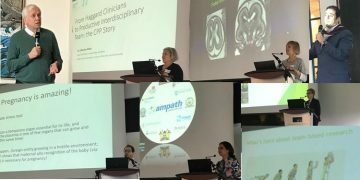 Denise Pugash talked about her research in fetal brain imaging and also shared new cross-disciplinary collaborations made possible by the Perinatal Research IMaging Evaluation (PRIME) Centre. Catherine Allaire described the evolution of the BC Women’s Centre for Pelvic Pain & Endometriosis and the UBC Endometriosis Pelvic Pain Laboratory. She mentioned the key factors that made their achievements to date possible – including a great team and an engaged patient-partner group. Mohamed Elgendi spoke about the challenges that Digital Health brings to consumers and the opportunities it affords researchers. With numerous diagnostics and other Apps available everywhere, there is a need to develop mechanisms to ensure public safety. Following the coffee break, Alexander Beristain described his research program which focuses on understanding how a healthy placenta works. He stressed the importance of collaboration, which take time, planning and communication to come to fruition. Astrid Christoffersen-Deb, who joined our department in 2017, discussed her work with AMPATH in Kenya. She talked about the AMPATH MNCH team, how it has grown, and how chama is applied to their work and research endeavors. Chelsea Elwood shared her work with the Reproductive Infectious Diseases Team. She talked about how clinicians, biostaticians and veterinary scientists have come together to gain a deeper and clinically relevant understanding of the vaginal microbiome. It was inspiring to see the diversity of research being carried out in the department and the productive and supportive collaborations that everyone is engaged in. 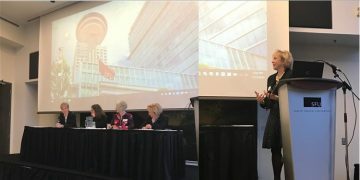 Kimberlyn McGrail (BC SPOR), Gail Murphy (Vice-President, Research and Innovation), and Zena Sharman (MSFHR) participated in the final event of the forum by leading a panel discussion moderated by Deborah Money on opportunities in translational research. They spoke about the efforts being made at the institutional and funder level to support translational research – e.g. MSFHR Convene and Collaborate Grants, VPRI’s Grants for Catalyzing Research Clusters, among other opportunities. They also talked about the challenges relating to enabling collaborations to grow organically rather than being prescriptive. Congratulations to our draw prize winners: Amy Dawson, Moe Elgendi, Sarka Lisonkova and Warancha Tumtaweetikul. Thank you to everyone who completed an evaluation form. All and all it was an excellent day of facilitated discussion. We are grateful to the generosity of Dr. Fred and Mrs. Jane Bryans for providing us with the opportunity to share research and ideas across the department. Thank you to everyone who presented and attended. We look forward to seeing you again in 2020!